Fort Lauderdale, FL – The nation’s average gas price once again pushed upward, although this week’s increase felt something more like a shove. According to the U.S. Energy Information Administration, the average price of a gallon of regular unleaded went up four cents to $2.35. Prices were up in all regions this week, and all survey districts ended up for the month, somewhat substantially for the Midwest and Lower Atlantic states, which had monthly gains of 14¢ and 13¢, respectively. The broad West Coast and California – ironically, where prices are highest – had the lowest price increases of the month, only about 2¢. Diesel fuel prices also went up this week. Once again, prices were not up as much as with gasoline, but truckers are paying another two-and-a-half cents per gallon for fuel, versus last week, according to the E.I.A. 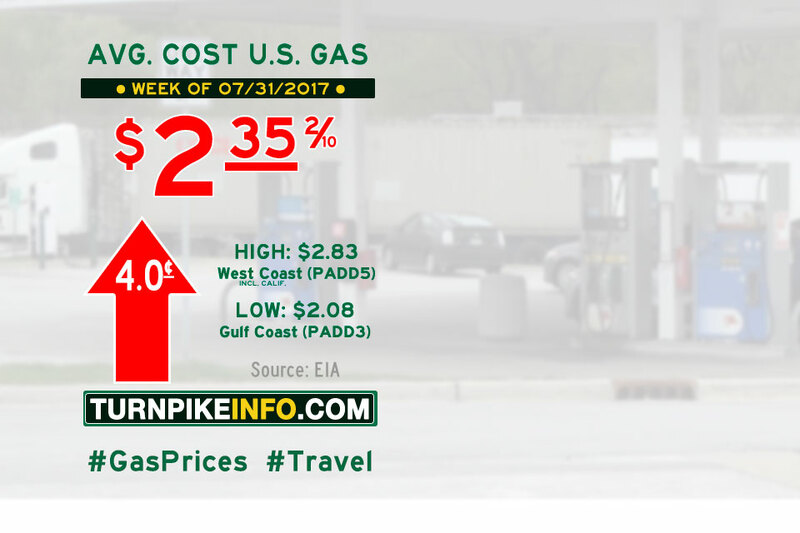 Nationally, prices have settled at $2.53 per gallon, though range from as little as $2.36 on the Gulf Coast to as much as $2.91 in California. Fort Lauderdale, FL – The nation’s average gas price pushed higher this week, according to the U.S. Energy Information Administration. The average price of a gallon of regular unleaded went up over three cents to settle over $2.31. Regionally, prices were up in nearly all locations, although curiously unchanged across the broad West Coast region, and even down when taking California out of the equation. Elsewhere, costs drove upward anywhere from just over a penny, as in the Rocky Mountains, to nearly a six-cent surge, as felt by drivers across the Lower Atlantic states. Prices for diesel fuel also went up this week, but not by as much as their gasoline counterparts. The U.S. average diesel prices are now $2.51 per gallon, after going up an average one-and-a-half cents per gallon this week, according to the E.I.A. Regional cost averages for both gasoline and diesel are listed below, ranked from highest to lowest price. Fort Lauderdale, FL – The nation’s average gas price retreated this week, according to the U.S. Energy Information Administration. The average price of a gallon of regular unleaded stands at about $2.28, down about two cents on the week. The decline comes after a sudden uptick in prices last week, which had followed four weeks of steady price dips. Region-by-region, prices were down across the board. Last week’s shocking price increase in the Midwest was offset by a decline this week of over four cents per gallon. That contributed most to the decline in the national price average. Prices for diesel fuel did not follow the trend of its petroleum counterpart this week, to the dismay of truckers. 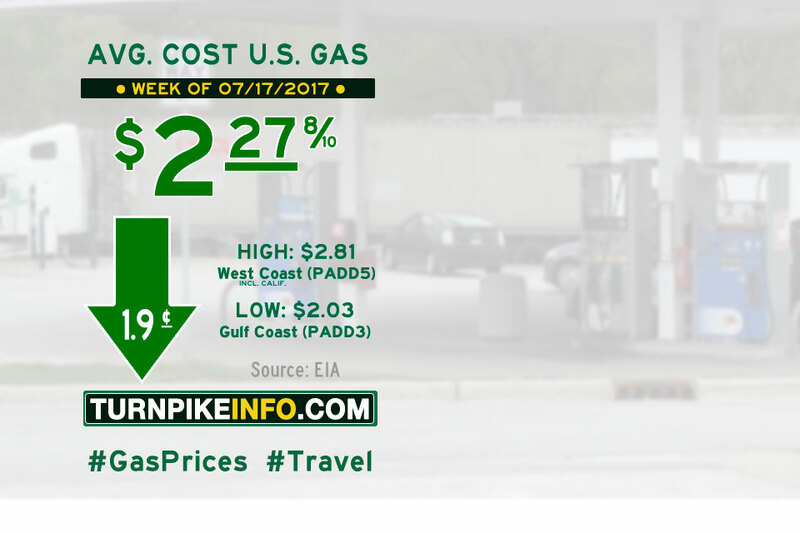 The U.S. average diesel prices are now $2.49 per gallon, after going up another penny per gallon, on average, this week, the E.I.A. reported. Regional cost averages for both gasoline and diesel are listed below, ranked from highest to lowest price. Fort Lauderdale, FL – After four straight price declines, the nation’s average fuel costs have gone up, according to the weekly fuel price survey from the U.S. Energy Information Administration. The E.I.A. 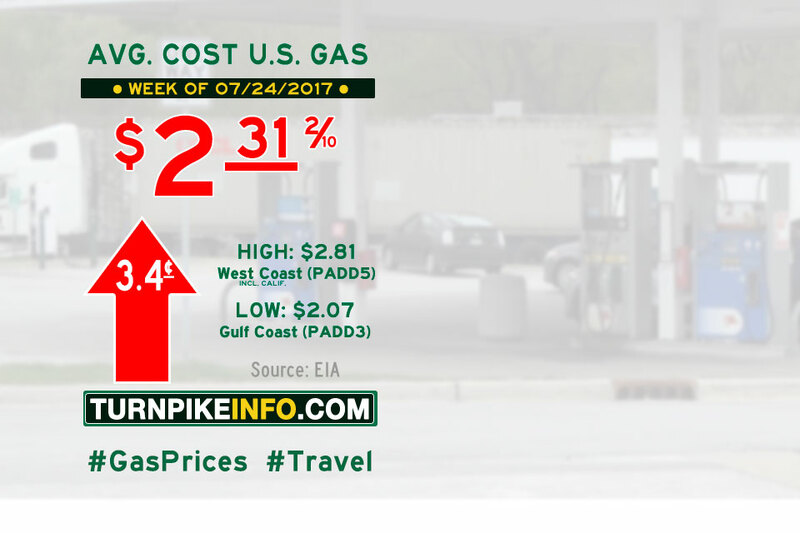 weekly report shows the nation’s average gas price went up nearly four cents per gallon to start the week at $2.30. The region-by-region tally was not quite as bad, however, as most drivers endured only slight increases in fuel prices. It was a stunning nine-cent increase in gas prices across the Midwest that contributed the most to the increase in the national price average. Prices across New England and Rocky Mountain states actually declined, albeit only slightly. Last week’s reversal of fortune for truckers continued into this week, as diesel prices edged up another penny per gallon. U.S. average diesel prices are now $2.48 per gallon, the E.I.A. reported this week. Regional cost averages for both gasoline and diesel are listed below, ranked from highest to lowest price. 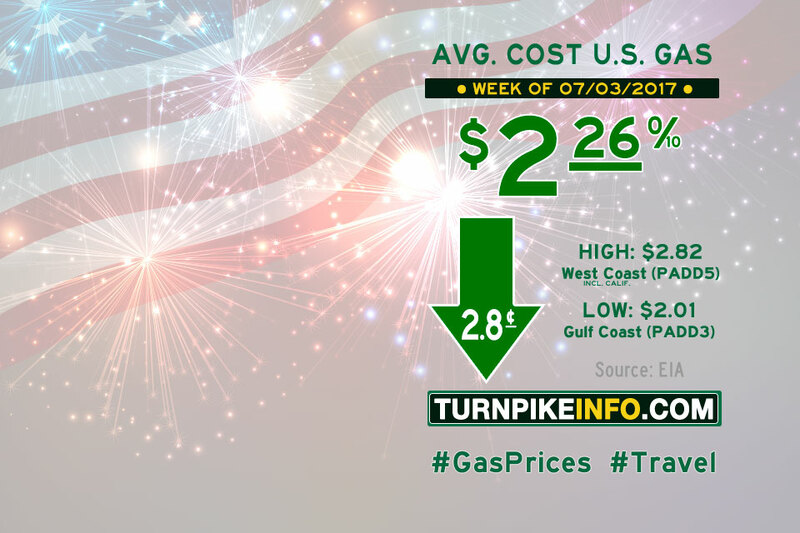 Fort Lauderdale, FL – Just in time for the Independence Day holiday, the U.S. Energy Information Administration reports this week the nation’s gas prices dropped for the fourth consecutive week, settling at $2.26 on a nationwide basis. Nationally, prices were down nearly three cents a gallon, making the third week of the past four that prices have declined at nearly the same rate. Regionally, price averages declined in a wide range between a penny and nearly a nickel per gallon. The West Coast had the lowest decline, while the Gulf Coast enjoyed the greatest price dip. It was a reversal of fortune for truckers, however, as diesel prices edged up for the first time in weeks. The cost of a gallon of diesel went up nearly a penny per gallon to $2.47, the E.I.A. reported this week. Regional cost averages for both gasoline and diesel are listed below, ranked from highest to lowest price.